We are so excited to announce that the Town of Parker Public Works Department has approved a landscaping plan for our RTF Angel Memorial Healing Garden. It all started when an Eagle Scout candidate asked if we might be in need of some help sprucing up the memorial plaza with some plantings and landscaping as a potential community service project to earn his Eagle with the Boy Scouts of America. The town of Parker Public Works Department was more than happy to assist us with the development of a plan to landscape the Memorial Plaza in two segments. A portion of this project (the lower segment of the design pictured, near the paved bike path) has been funded and completed as part of the Eagle Scout project. The rest is up to us and we need your help. The Public Works Department has generously agreed to donate all the labor and design work for the project, so we are responsible only for the materials! UPDATE: Given the challenging nature of our present economy, we have revised the design to reduce the estimate to approx: $15,000. 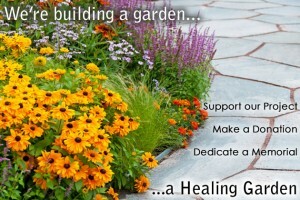 Donate to the Angel Memorial Healing Garden Fund. Download the flyer and spread the word. Corporate sponsorships are available. Certain sponsor levels will receive a permanent engraved tile at the memorial plaza thank you. Sponsor a tree (please see details about MAY 1 LOTTERY) or a garden segment. Let us know if you or someone you know is willing to help with donating landscaping materials, or nursery plantings. With your help, we can complete this project and make visiting the Angel Memorial Plaza an even more peaceful and beautiful experience. Email or call with any questions about this project. Donations are tax deductible as allowed by law. Reading through this ost reminds me of my previous room mate!